Chief of Police Lawrence L. Battiste IV has served 28 years in law enforcement. 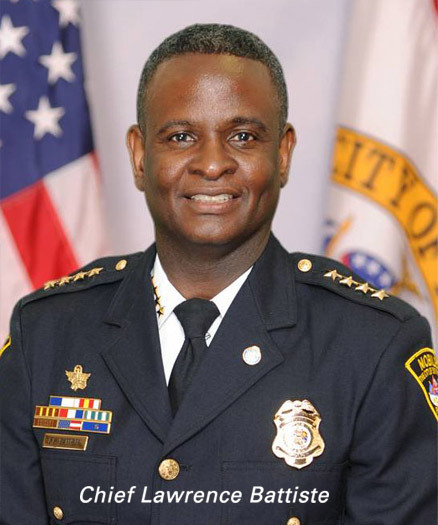 Prior to being appointed the City of Mobile Police Chief in April 2017, he was the department’s Assistant Police Chief, commanding several divisions. He is the former Chief of Police for the City of Prichard and previously worked as the Chief Juvenile Probation Officer for Mobile County. Throughout his career, Chief Battiste gained a wide range of experience from serving in Narcotics and Vice, SWAT, and General and Major Crimes Investigations. Chief Battiste earned his master’s degree in Justice Administration and bachelor’s degree in Human Resources Management from Faulkner University. He holds current memberships with the FBI National Academy, International Association of Chiefs of Police, Alabama Chiefs of Police Association, and National Organization of Black Law Enforcement Officers (N.O.B.L.E.). With experience in various facets of law enforcement combined with superior performance, Chief Battiste has been awarded the Mayor’s Eagle Award, Deputy of the Year, Sheriff’s Commendation, Commander’s Citation, and the Combat Cross award. He is also a United States Navy veteran.